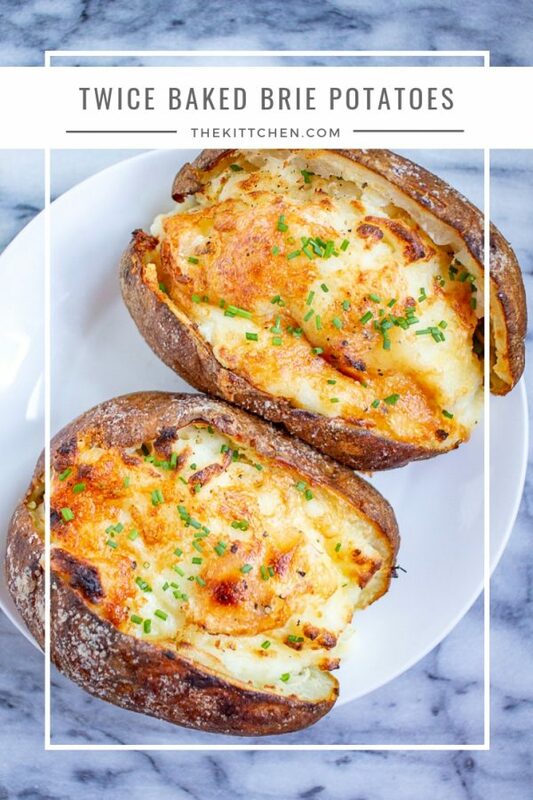 Twice Baked Brie Potatoes are baked potatoes with crispy salty skins that are filled with creamy mashed potatoes made with brie, sour cream, garlic, and parmesan. 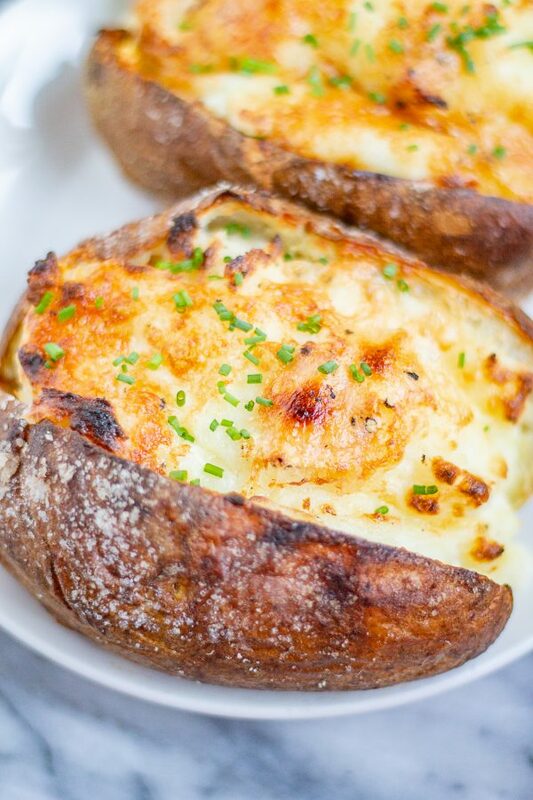 I combined two of Charles’s favorite foods to create these Twice Baked Brie Potatoes. He loves baked potatoes – I think it is a British thing, and he loves brie even more. 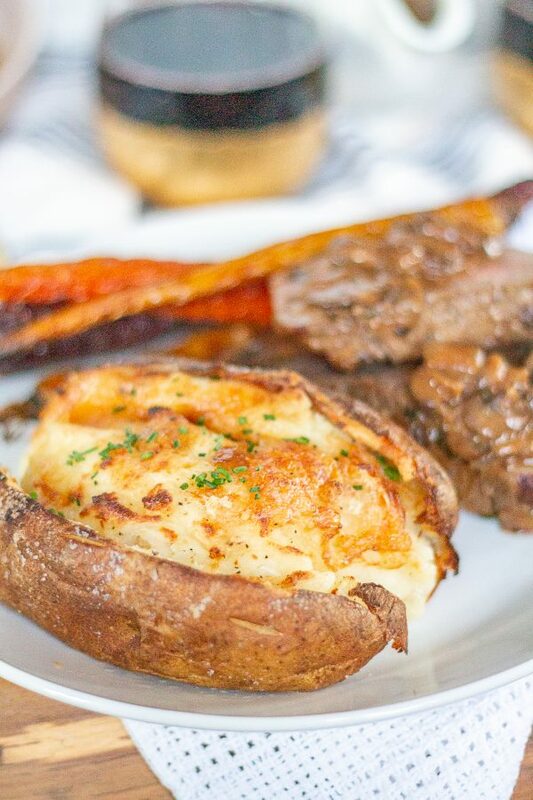 We hadn’t thought of combining the two until we discovered brie potatoes at The Gage, a restaurant in Chicago. To make these potatoes, rinse and dry the potatoes. Then poke a couple holes in them just to prevent the unlikely scenario that they explode in the oven. Now slather the potatoes with butter, and generously sprinkle them with butter. 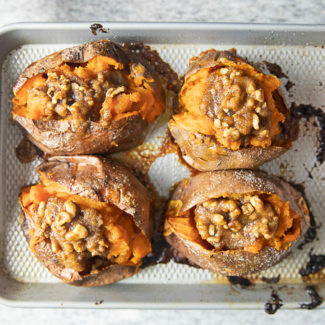 Roast them in the oven for 45-60 minutes until very soft (place them on a baking sheet so you won’t end up with butter melting and burning on the bottom of your oven). 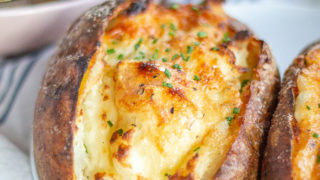 Once the potatoes are cooked, you want to slice them open, scoop out most of the insides, and then mash that up with some butter, minced garlic, brie, parmesan, sour cream, salt and pepper. 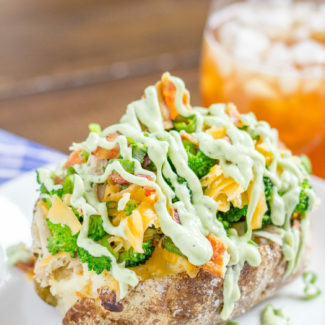 The mashed potato gets scooped back inside the potato skins. Top with a bit more brie and return the potato to the oven to cook for another 25 minutes. 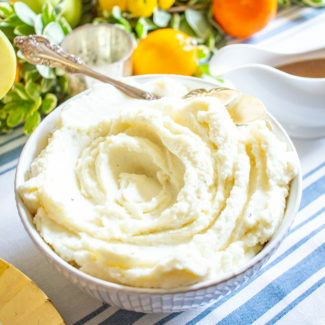 The cheesy mashed potato and the crispy salt potato skins are such a lovely combination. It isn’t the healthiest side dish, but it’s great very once in a great while. 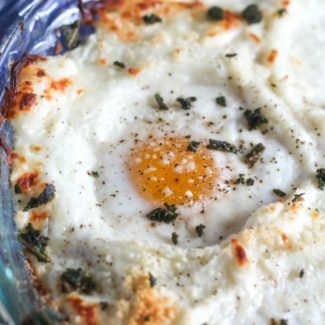 It’s something my mother would make a couple times a year, and it was one of my favorite foods as a child. 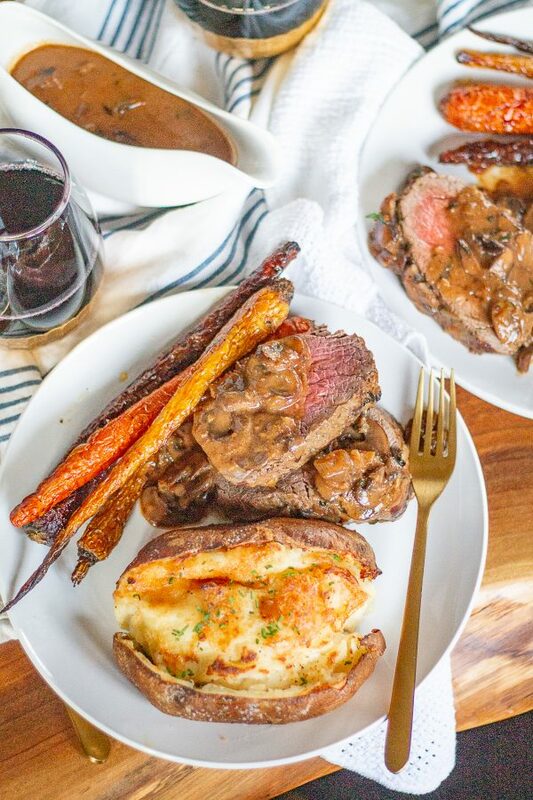 I served the Twice Baked Brie Potatoes with Beef Tenderloin and a mushroom shallot gravy, and the gravy was excellent over the potatoes. 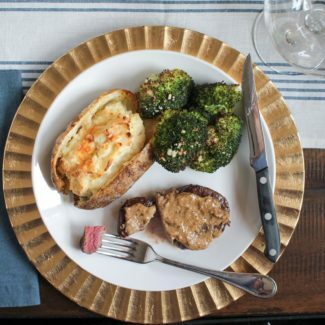 It’s a perfect homemade special occasion meal that is just as delicious as dinner at a restaurant. 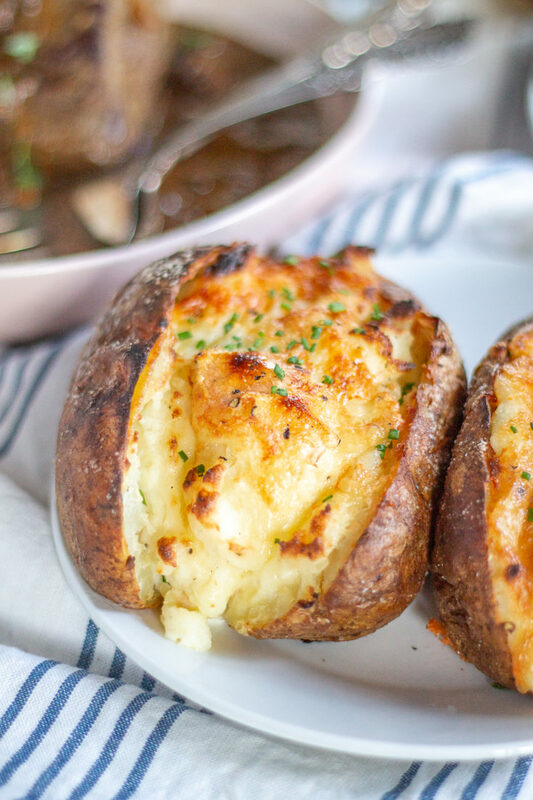 The recipe below is for 2 Twice Baked Brie Potatoes, but you can certainly double or triple the recipe as necessary. When you are mashing the potatoes I do like to add a little too much sour cream, the potatoes will dry out in the oven and this prevents the mashed potato from being too dry. Heat your oven to 375 degrees. Rinse and dry the potatoes. Take 1 tablespoon of butter and divide it between the two potatoes and rub all over. Generously sprinkle salt over the potatoes. Place the potatoes on a baking sheet and let roast for one hour. After one hour, remove the potatoes from the oven. They should be soft on the inside - if not you can let them cook a little longer. Slice the potatoes in half, and scoop out about 2/3 of the inside. You want a layer of potato to be left on the skin. 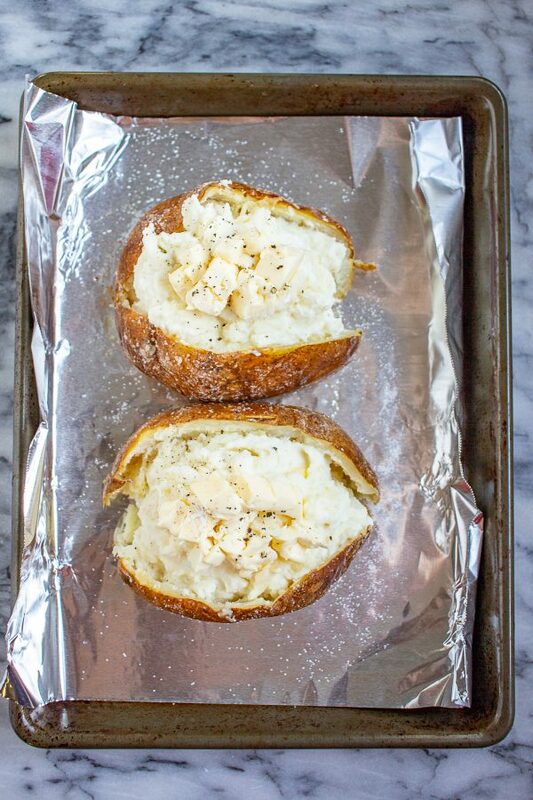 Combine the scooped out potato, 1 tablespoon butter, the sour cream, 1/3 cup brie, the parmesan, ½ teaspoon salt, and the black pepper in a bowl. Mash to combine. Taste test and add more salt and pepper if necessary. 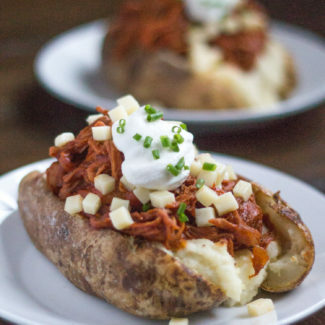 Scoop the mashed potatoes back into the potato skins. Top with the remaining brie. Bake for another 25 minutes, and then serve right away.